Bought 4 units from them, all have had 1 issue or another. When they work they are INCREDIBLE lights. If you send them in for service... they keep them and tell you that you will get a (SMALL) discount on a new set but never have an intention of fixing your lights. When I asked what was wrong with them it took 5 minutes to make something up while "They were looking it up". Who wants to by more light from a company who won't stand behind the products that were already purchased from them. This is the WORST company, worst customer service, worst technical support... I would have been happy with refurbished parts just to get my lights back into service. There are too many companies selling lights for me to ever buy from these swindlers again. Call consumer affairs. BRS this review need to be where people can make a educated decision on this company and their cheaply made components. Had to replace all my lighting in my fish tank, due to Aqua Illumination Not having replacement parts. Bought 3 of these and from the very beginning had issues with them. Had to call support several times which were helpful at the time but as time passed by my coral were starting to die even though all water parameters were good. Eventually I sent 2 of the 3 for the company to run diagnostics on the units and come to find out they were defective in several ways and the company would offer is a discount on new ones if I choose to buy them but wouldn’t replace them since I had an ongoing record of issues with the light. I purchased the Hydra 52 lights a couple of years ago. The controller went bad and they said they do not have the controllers and I would have to purchase new lights. Unreal! This company doesn't stand behind their product. Previously, I was using a no-name brand purchased from a local fish store, and received much better service. After months of reviews, reading, and talking with people I went over to Hydra 52 HD's and love them. My tank is growing like crazy and love the colors. I will recommend them to everyone I talk to about lighting. I really like my new lights. My only complaint is it took three tries to update firmware on my 3 lights. Not a lot of documentation describing features. I really like the acclimation mode as these lights are much brighter than my old ones. My hammer corals & sea anemones look better already. Rail kit made installation easy. 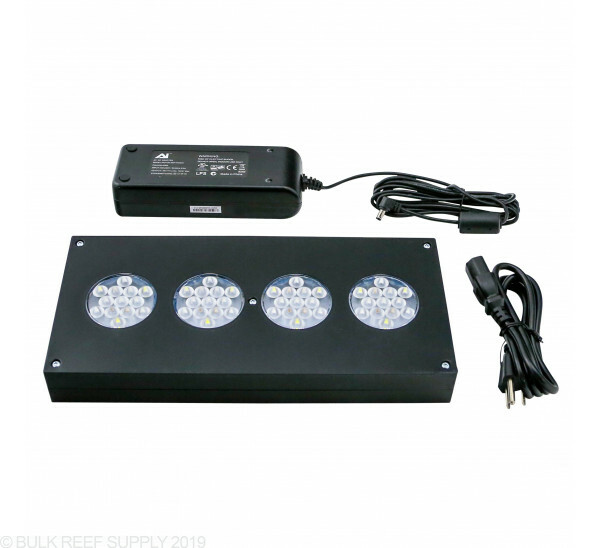 I went through several lights before finally investing in (2) Hydra 52 HD lights for my 90 gallon reef tank. The ability to use a well designed iOS app to set specific schedules or manually adjust lighting is an excellent feature. The lights themselves produce a brilliant display for all times of the day. I combined these lights with the ext ceiling hanging mount and I'm not disappointed. My corals and fish love these lights. I have a 48x24x24 tank looking to upgrade my lights. 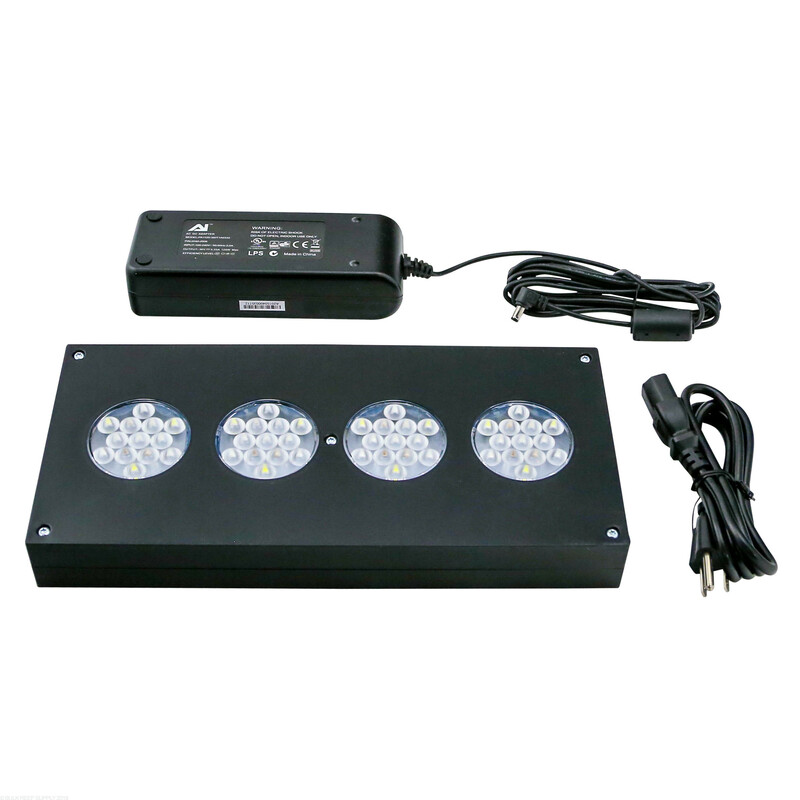 Will 2 Hydra 52 lights be sufficient? What would be the best mounting orientation for them parallel or perpendicular? 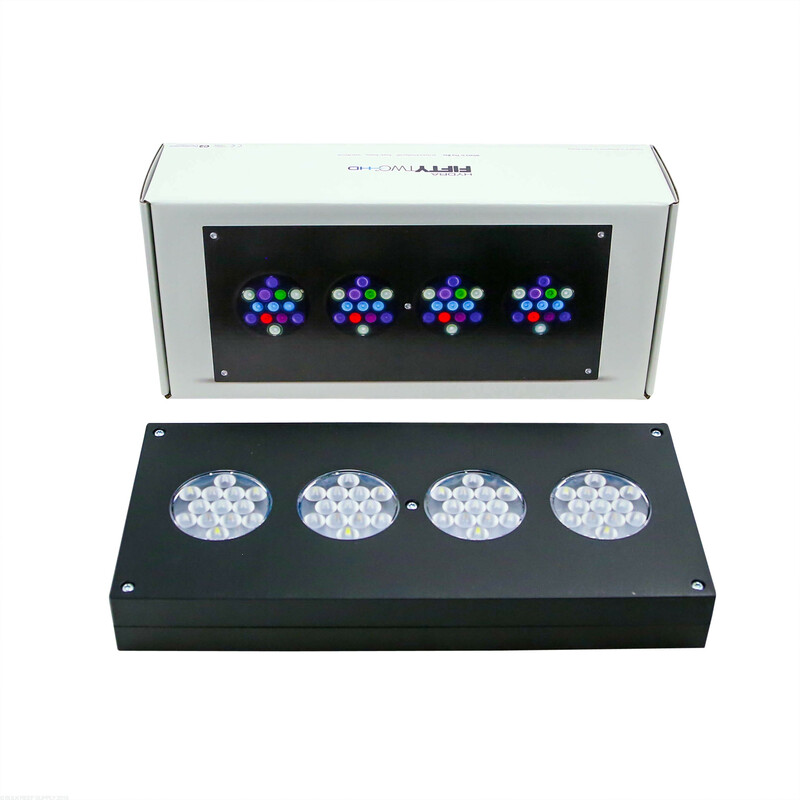 Is the AI Hydra 52 HD compatible with the AI Hydra 52 hardware controller? I have a 72x24x24. 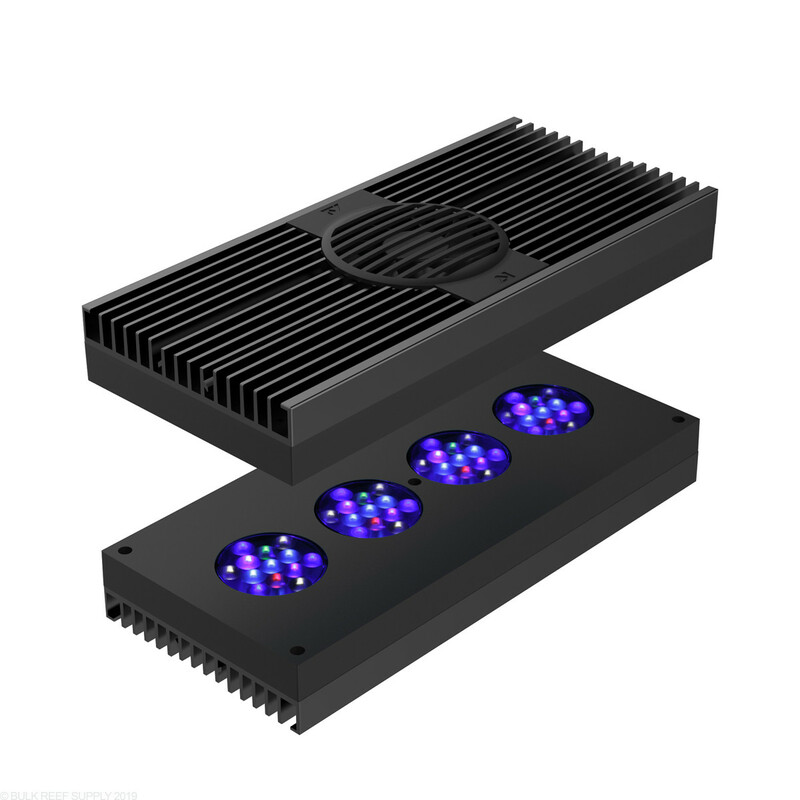 Would 3 of these fixtures spaced 18" apart work well, or would you recommend 4 spaced 14.4" apart for best growth and color on a mix SPS LPS system? Theses have a 30" x 24" spread and 3 would work well on a mixed SPS LPS tank. Do I have to have the wireless controller to set specific schedules and adjust lighting? Where can I get them? 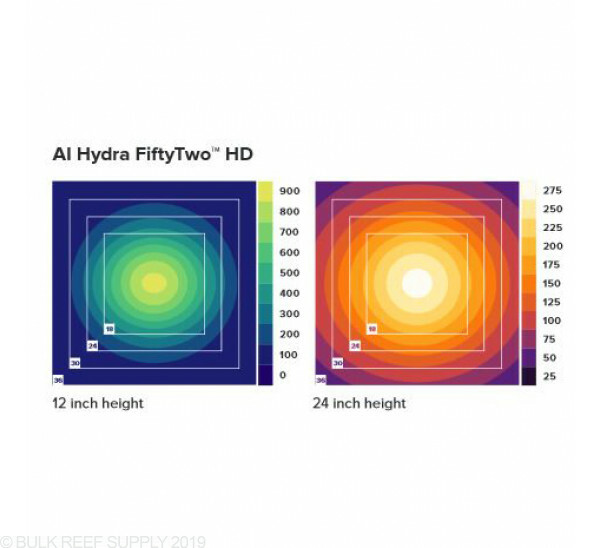 Would this work for a 24x24x20 tank or would 2 AI hydra 26 fixtures be better? That would actually be just about perfect for that size tank! Is this light controllable from the Apex? The 52 will have a great of 30" x 24" realistically 3 would be a minimum for best spread across the tank. Feel free to let us know if you have any further questions! A single Hydra 52 HD would be lacking in light on that size tank. We wouldn’t really recommend that light for any tanks wider than 30” at most. For a 32” long tank you would definitely want two of those. You may want to look into the Hydra 26 HD lights since two of them will cover your tank as well. How many units for a 36" x 36" cube? About 26 " deep. Would this light be good on a 54 gallon bow from tank? It's about 26 in across in longest part. And 20 inch deep? 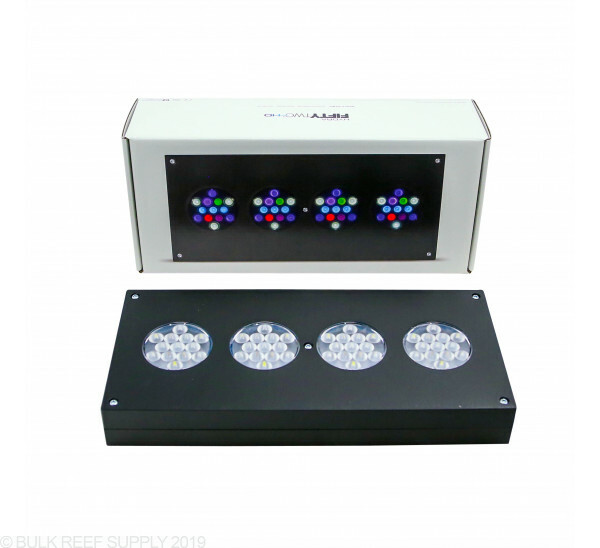 48x24x30 tall (150g tall) will two of these lights be sufficient for a mixed reef tank? Mainly softies and lps but some sps in the future. Thanks! A pair of 52's should be plenty of light for a mixed reef. 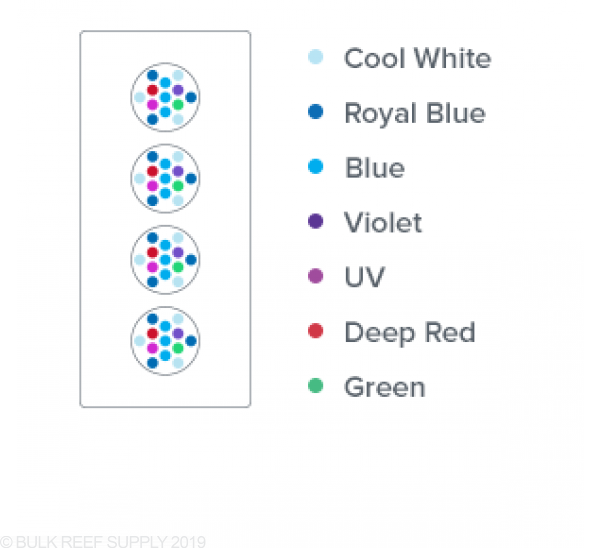 Obviously there will be some areas brighter than others, but this creates a gradient which allows for mounting flexibility for different corals. With proper placement, sps should be able to thrive just fine. I have a 6' 125g tank with the two dividers. Would three of these work for a mixed SPS/LPS tank? Thank you for reaching out to Bulk Reef Supply! 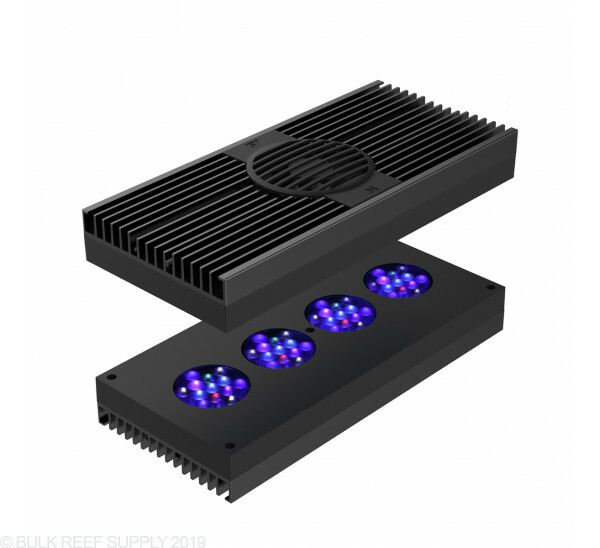 Yes, three of the Hydra Fifty Two HD LEDs would work if evenly spaced above your tank as these lights preform best when covering a 24" x 24" spread each. I hope this was helpful. Happy Reefing! On the hanging kits i dont see any bolts, are the bolts on the fixture? 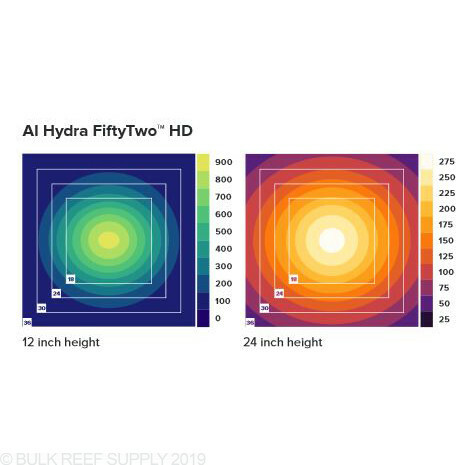 How many modules would I need for coverage on a mixed reef 65 gal 37" long, and 24" deep? If one isn't enough, can I sync a fiftytwo and a twentysix together? The spread of a single light is 30" x 24". While they will not be synced together per se they will work through the same app and run the same programs.